Many of our patterns and finishes on aluminum are created with layers of decorative processes. A popular request is to make use of selective areas of mechanical finishes - stripes, spins, and brushes on the surface of the metal. The resulting decoration has movement and depth which can then be built upon with transparent tints of color and printed tones for detail. Layering of processes is the foundation for this year's Holiday Card. This is a beautiful showing of the possibilities for adding areas of interest as well as visual depth and dimension without additional tooling investment. Incorporating areas of spins and stripes creates an optical effect where light is reflected off the surface of the metal at various angles. The resulting movement is a way to catch attention without being too bold. The ornaments and images in the background of this year's card showcase these effects. Patterns can be printed so that they change scale or intensity as they are laid down across surfaces. Soft detail frames the edges of this year's card with fades and tones, adding further interest. A tint of color applied to a selectively brushed background gives you a tone on tone effect as the color is printed on both bright and brushed aluminum. A transparent red is printed overall and appears as a two-tone color depending on which area of the card your eyes are focused on. Metallic colors rely on metal flakes added to color formulations to create options ranging from fine to coarse metallic effects. 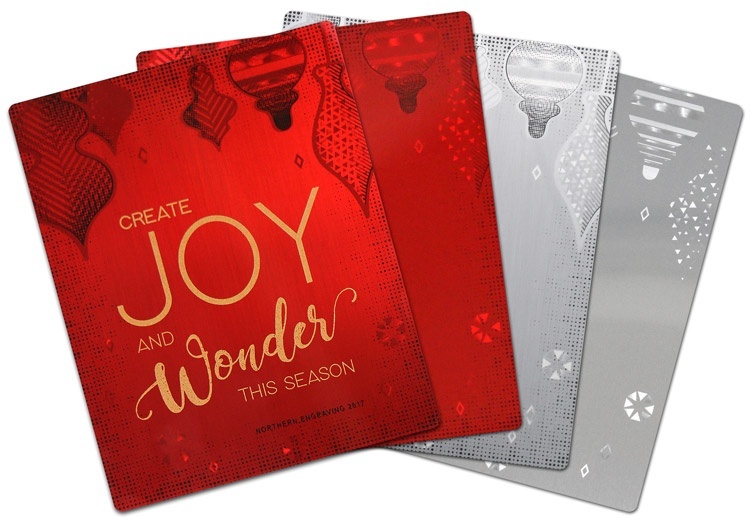 The graphics for the Holiday Card have a medium fleck to give a hint of a bead-blast look and feel to contrast with the high gloss background. Want to see more? Let this quick video walk you through some of the layers and processes used to create this year's card. Enjoy!